Few herbs are as universally grown and loved as much as rosemary. The refreshing resinous scent and flavour of its evergreen foliage is indispensable in cooking. The flowers vary from pale to rich blue, violet, mauve, pink or white. The form varies, from rounded bushes and prostrate varieties to columnar varieties up to 3m tall. The majority are well suited to culinary uses. All are evergreen with small. dense, shallow, pointed leaves. This plant requires full sunshine and excellent drainage. Rosemary is tolerant to a range of pH, from moderately acid to moderately alkaline soil, although the latter results in more compact growth and intense fragrance. In colder areas, grow plants in pots outdoors, then take them into the greenhouse in winter. This herb is excellent for seaside plantings. Propagate rosemary bu tip cuttings taken in early autumn or spring. Rosemary seed germinates poorly, and plants do not come true to variety. Regular light pruning helps to shape plants. Bushes respond well to clipping and shaping, and make excellent topiaries. In milder climates, take clippings of rosemary any time of the year, then air-dry in a well-ventilated place. When completely dry, strip the whole leaves from the stems and store in airtight bottles. Major harvesting should be done before flowering. Gather fresh flowers to use as a garnish on salads and desserts. The bruised leaves have a cooling, pine-like scent, with mint and eucalyptus overtones, and the string taste can overwhelm other flavours if used too generously. It complements similarly strong flavours such as wine and garlic, starchy foods, rich meats, eggplants, courgettes (zucchini/marrows) and brassicas. It is also used in sausages, stuffings, soups and stews or steeped in vinegar or olive oil to flavour them. The leaves have a rather woody texture, so use them finely chopped. Alternatively, use whole sprigs or tie leaves in a square of muslin, and remove just before serving. 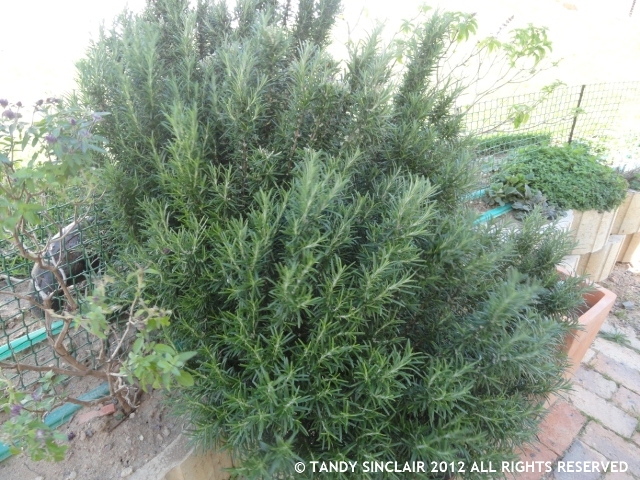 Dried rosemary has a flavour similar to that of fresh, but its very hard texture may not soften, even on long cooking. Rosemary is popular in Italian cookery. Make a simple and delicious pizza topping with thinly sliced potatoes, crushed garlic and chopped fresh rosemary leaves. Absolutely one of my most used herbs.